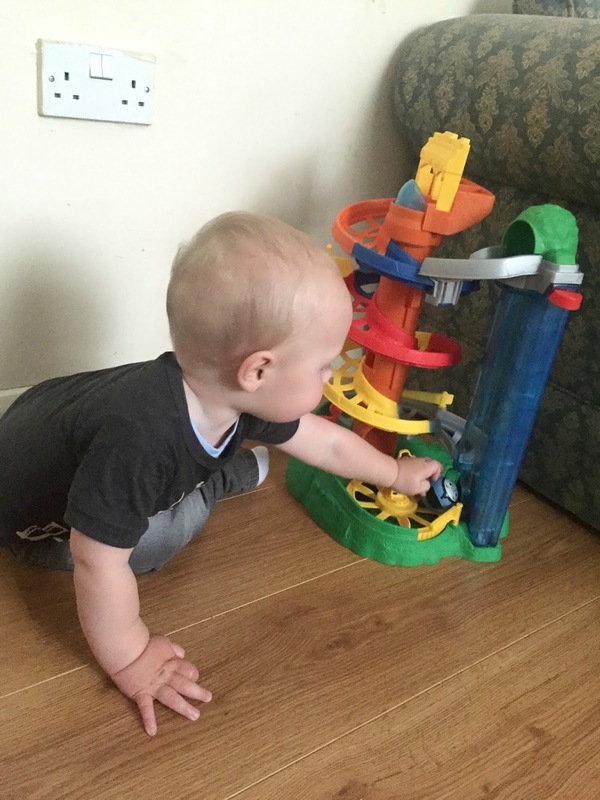 We were recently sent a My First Thomas & Friends Rail Rollers Spiral Station toy for Jacob to review. I just knew that Jacob and his sister would love this toy as they both like Thomas and this toy was unlike anything that they already have. I was right because as soon as they both saw it they made a beeline for it and have not stopped playing with it since. When I opened the box I was a bit nervous as it is all in bits and I am totally useless at building toys, as I don't have the patience. I need not have been worried though as there was no screws, batteries or anything to build as the whole toy just clips together easily with super simple diagram instructions included. It only took me around five minutes to build the toy which I was impressed by, as there is nothing worse than trying to build toys for eager little ones to play with. The toy comes with two, really easy for toddlers to hold, round ball engines Thomas and Diesel. The aim of the toy is to drop your engine into Tidmouth station where it will race down the spiral train track to the end, where it is met by the fat controller and spun around on the roundabout at the bottom. You can also drop the engine down the central station where it will also be met by the fat controller at the bottom. My two love racing each other with Jacob dropping his engine down the spiral track and Sophia always drops hers down the central station. 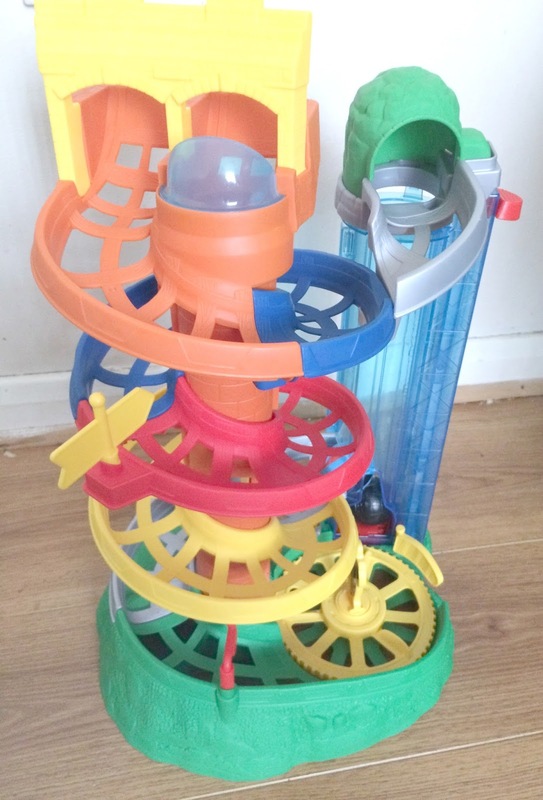 The toy also has an engine lift which you can push up and down with a little leaver and which transports the engines to the top of the spiral station ready to roll down the track. My two-year-old Sophia loves this and spends ages playing with the lift transporting the engines to the top and back down again. 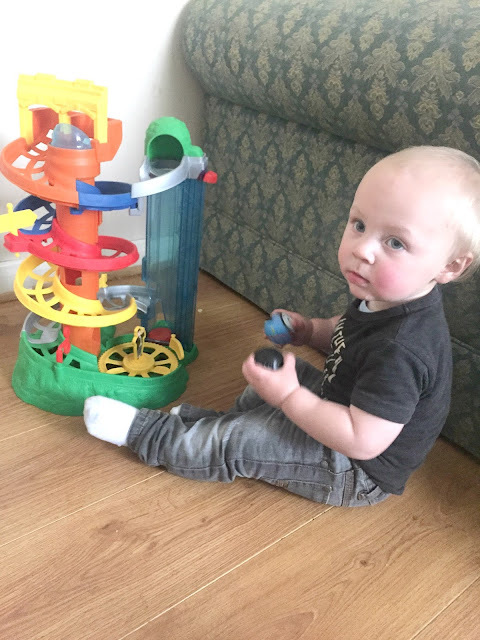 The toy is aimed at children aged 12 months plus, which I thought would be perfect for Jacob, who is aged 13 months. Jacob totally loves this toy and straight away he figured out what to do with it and how to play with it. He actually sat and played with it for almost an hour non-stop, which anyone with toddlers will tell you is practically unheard of as they love being on the move so much. 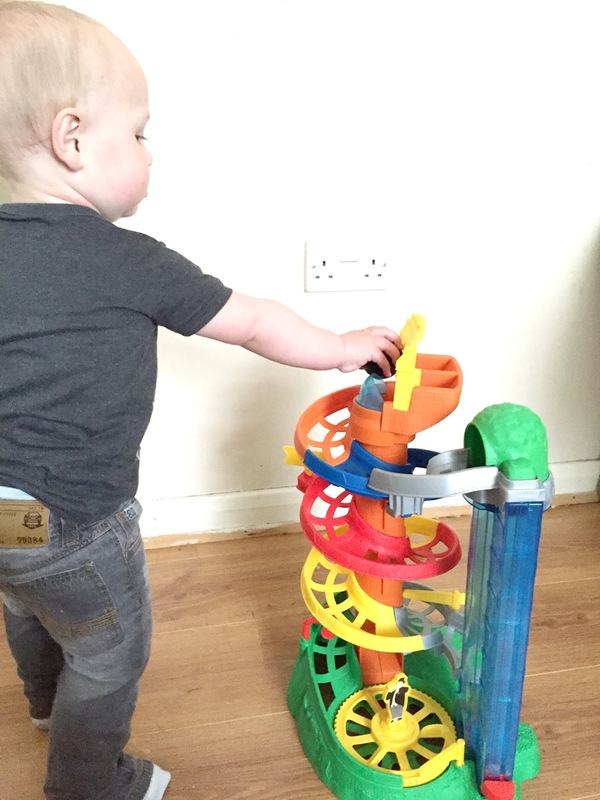 Sophia who is 2 year 4 months also loves this toy and she will sit for ages playing with it especially the lift as she loves making this go up and down. I was a bit worried that as the station all just clips together that it might be a bit flimsy and fall to bits, especially with a boisterous one-year-old playing with it but I am really impressed with just how sturdy it is. Jacob has grabbed, knocked over, picked up and dropped and tugged at the spiral station and it has not come apart once. It is really secure and sturdy and safely withstands toddler destruction. This toy is perfect for little ones between 1-3 years old, both younger and older toddlers will have so much fun playing with this toy. It is great for hand-eye coordination and is really bright, colourful and fun for capturing little ones attention and will bring hours of fun. My two have not stopped playing with this toy all week and it is probably the only toy that they actually play with together. My First Thomas & Friends Rail Rollers Spiral Station costs £32.99, you can also buy extra rail roller engines separately to go with the set. It would make a great Christmas present for children aged 12 months plus and I know that if Jacob had not of been sent this to review then it would defiantly of been on his Christmas list this year. It is such a great toy that I am sure will be played with and enjoyed for many more years in our house. Disclosure we were sent this toy free of charge for the purpose of this review, however all words and opinions are my own. oh wow this looks like a fun activity. Although I only have a girl, we had a thomas tank engine set which she loved. She is now 7 and i've just sold it on but they are such fun for the little ones no matter what gender! My son would have loved this a few years ago. There's lots going on with it isn't there? Love all the wheels and moving bits. Finley wouldn't entertain this at all which is such a shame as it looks so great quality. John Lewis have one similar at the moment reduced to a fiver - perhaps I could test the water with that one first before taking the plunge with Thomas! Awh this looks like great fun. Definitely something to think about for the nephew at Christmas time. My little sister would absolutely love this she is obsessed with Thomas and would be squealing with delight. I know what to get her for Christmas now thank you!